In a recent post, I have written about Santoshi Mata and her relevance in today’s age, for getting satisfaction and as marriage is one of the main factors, which give satisfaction in life, this is a great Mantra for finding that elusive satisfaction. Santoshi Mata symbolizes family values and a contented domestic life, more information on Santoshi Mata can be found in the article – Here. The Mantra Sadhana has to be commenced on Friday of the Shukla Paksha [Friday of the Bright Fortnight of a Hindu Lunar Month]. 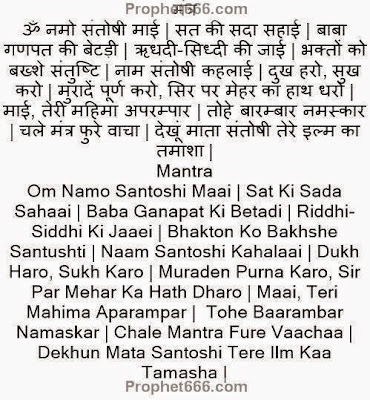 Thereafter, the Santoshi Mata Vrat and Mantra Sadhana should be continued on all coming Fridays The marriage aspirant should take a Sankalp [Pledge] that she will continue the Santoshi Mata Mantra Sadhana until she get married. The girl should keep a fast on Fridays and avoid the consumption of sour foodstuff like lime, buttermilk and other such sour foods on Friday. She should offer a Prasad of Chana-Gud to Santoshi Mata and chant the Mantra 108 times. A Rudraksha Beads Mala is suitable for counting the number of Mantra Chants. The Mantra Sadhana should be avoided on those Fridays when the girl is having her Monthly Cycle. Fast should b cont. During montly cycle?? In fast can we v eat one time ? Fast should be continued during the Periods, But the Puja and Mantra Chanting should be discontinued during the Periods.